14 runninginsight.com © 2017 Formula4media LLC. IntelliSkin makes posture a priority in its products. Its Smart Compression works with the body's anatomy and physiology to tone underused muscles that lead to Upper Crossed Syndrome. "Intelligent compression stimulates the body to fire underused muscles to align the body and create joint centration," says Dr. Tim Brown, founder and IntelliSkin inventor. "PostureCue and CoreCue Technologies restore the natural body alignment we were all born with." Brown says that each time IntelliSkin apparel is worn, "it's like a mini posture workout because it makes your body do the work. You become stronger and more confident as your proprioceptive awareness of good body alignment becomes second nature. Braces can make you weak and dependent. IntelliSkin stretches, strengthens and aligns your body from the moment you put it on." 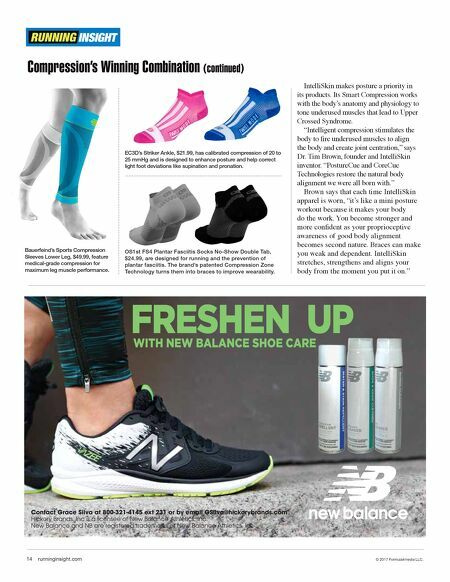 Compression's Winning Combination (continued) EC3D's Striker Ankle, $21.99, has calibrated compression of 20 to 25 mmHg and is designed to enhance posture and help correct light foot deviations like supination and pronation. Bauerfeind's Sports Compression Sleeves Lower Leg, $49.99, feature medical-grade compression for maximum leg muscle performance. OS1st FS4 Plantar Fasciitis Socks No-Show Double Tab, $24.99, are designed for running and the prevention of plantar fasciitis. The brand's patented Compression Zone Technology turns them into braces to improve wearability.